After deciding to adopt a new process a key challenge is to actually start doing it. 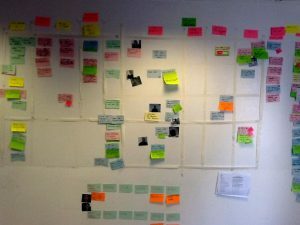 This is the story of how our team decided to implement code review as part of our process, and how our kanban board helped us. The kanban board helped us visualise this new step in our process and allowed us to see that despite our belief and enthusiasm in introducing code reviews, we weren’t actually doing them. Reviewing the board at the daily stand up meeting provided visual feedback that lead to productive conversations about what might be stopping us and how we could improve. After we implemented new behaviours the board highlighted whether they made a difference and allowed us to continue to monitor our behaviour. During the daily stand up meetings in the first week of working with the new process, many tasks were described as “finished development” but they hadn’t been code reviewed. We started moving those cards to the right of the “In Dev” column. Within a couple of days it was clear that we had a queue of index cards to the right of the “In Dev” column. What’s your experience implementing new process steps such as code review? Have you found visualising has been effective in reflecting how well your doing? Have you redesigned the way you visualise things in order to help you act more effectively? Let me know your views and experience in the comments.